Kalakand recipe – To make this Indian sweet, you will need only two main ingredients milk and sugar. For flavoring and garnishing, cardamom powder and pistachios are used. It has crumbly and grainy texture with sweet milky taste. This is neither the traditional method nor the instant method. The recipe method I am sharing will come in between both. But the taste of the it is very very close to the traditional version. The traditional method of making this sweet is very time consuming. For that milk is simmered till it gets thick and then sour ingredient (e.g. yogurt or alum) is added to make the grainy texture. And then it is again simmered with addition of sugar till it gets thick and burfi consistency. This whole procedure may take more than an hour. So to cut down the time, here you can see I have made cheena and thickened sweet milk separately. And then combined both. By doing this, it can be ready in half of the original time only. Usually the color of kalakand should be little on brownish side. But since we are making it with different method so we are compromising on color but not on the taste. 1) Start by making cheena first. For that take 3 cups of milk in a pan on medium heat. And bring it to a boil. 2) Once it starts boiling, add lemon juice and keep stirring till the milk solids and whey get separated. 3) Then turn off the stove, You will notice the cheena is floating on top of that greenish whey. 4) Now line a strainer with muslin cloth or man’s handkerchief. Using that drain the cheena. Run through the running cold water to get rid the lemon’s citrus flavor. The squeeze out the excess water lightly. 5) Take take cheena to a plate and crumble it. Keep it aside. 6) Now take remaining 1 ½ cup of milk in a pan on medium heat. Bring it to a boil and let it simmer till it gets its half quantity. It may take around 5-6 minutes. 8) Mix and simmer for 2-3 minutes. 9) Now add prepared cheena. 11) Keep stirring and continue simmering. 12) Cook till all the moisture/milk is evaporated and you get thick mixture. 13) In this photo on left, you can see it is thick but still not ready yet. Because it is still bubbling from the sides. 14) Continue cooking till there are no more bubbles. Now turn off the stove. 17) Grease the plate or container with ghee. In that pour the mixture and spread out evenly. 18) Sprinkle the chopped pistachios on top. 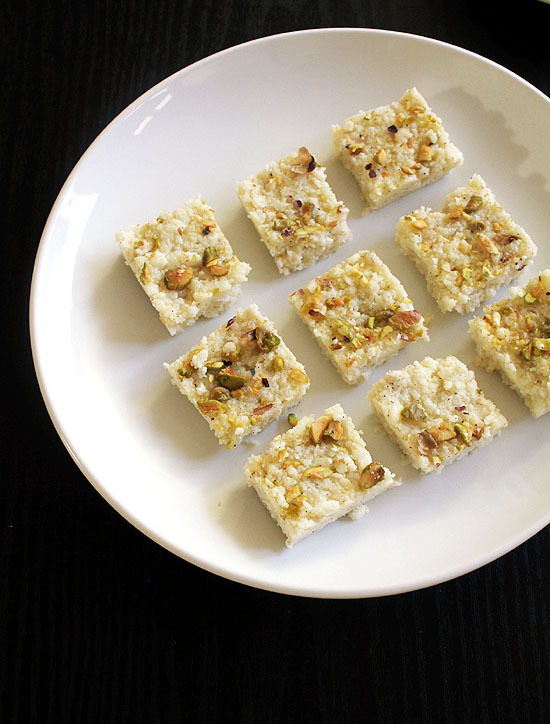 Using hands, lightly press it so pistachios will stick to the kalakand. 19) Let it cool down completely and let it set. Then using sharp knife make square pieces. 20) Remove the pieces gently and serve. Kalakand stays good for 2-3 days at room temperature and for a week in refrigerator in airtight container. If you are living in humid/hot weather then it is recommended to store in the refrigerator only. Serving suggestion: This kalakand is usually made and served during festivals like Diwali, Holi, Eid etc or on special occasions. Kalakand recipe – To make this Indian sweet, you will need only two main ingredients milk and sugar. Bring 3 cup of milk to a boil on medium heat. Once it starts boiling, add lemon juice and keep stirring till the milk solids and whey get separated. Then turn off the stove, You will notice the cheena is floating on top of that greenish whey. Now line a strainer with muslin cloth or man’s handkerchief. Using that drain the cheena. Run through the running cold water. Then squeeze out the excess water lightly. Take take cheena to a plate and crumble it. Keep it aside. Now take remaining 1 ½ cup of milk in a pan on medium heat. Bring it to a boil and let it simmer till it gets its half quantity. It may take around 5-6 minutes. Now add sugar. Mix and simmer for 2-3 minutes. Now add prepared cheena. Mix well. Keep stirring and continue simmering. Cook till all the moisture/milk is evaporated and you get thick mixture. Grease the plate or container with ghee. In that pour the mixture and spread out evenly. Sprinkle the chopped pistachios on top. Using hands, lightly press it so pistachios will stick to it. Let it cool down completely and let it set. Then using sharp knife make square pieces. Remove the pieces gently and serve. The kalakand looks yummy! I am going to try this recipe.